This PDF 1.5 document has been generated by PScript5.dll Version 5.2.2 / Acrobat Distiller 9.3.0 (Windows), and has been sent on pdf-archive.com on 18/09/2013 at 20:27, from IP address 24.4.x.x. The current document download page has been viewed 727 times. 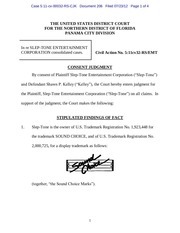 possible violators of trademarks owned by our client Sound Choice®, Sound Choice Studios, Inc.
overwhelming evidence that substantiates the before mentioned claims of trademark violations. 15 U.S.C. 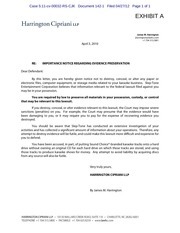 §§ 1114 and 1125.
documented and recorded and may be used against you in a court of law. 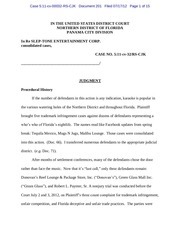 law, and to encourage you to discuss a prompt and reasonable settlement in regard to this matter. copyright in the underlying musical work for the copies you made or acquired. set of disks for each and every system in operation. before we formally begin the lawsuit. business without violating Sound Choice’s rights. right now. Your competitors are being offered the same deal, so it is important that you move quickly. Sound Choice wants the karaoke community to know that it has taken this step reluctantly. consulting an attorney of your choice, since we cannot give you legal advice about this matter. This file has been shared by a user of PDF Archive. Document ID: 00124276.